K&S Industries is a family-owned business based in Shepparton, Victoria. The company started life in 2001 as an investment in a cold storage facility which complemented our families horticultural farming business. This was to ensure a consistency of supply of quality products to the market for seasonal fruit and to secure long-term storage facility. In 2002 K&S Pallets moved into the manufacturing of fruit bins for the storage of produce, and from there into the production of pallets. During the last 15 years has seen the installation of modern automated pallet manufacturing and repair equipment. We recently purchased a unique Pallet Design Software Program, which has assisted our pallet operation to achieve significant pallet and export pallet orders, as the program allows us to design the correct pallet configuration and load rating for any type of pallet, with cost savings, passed onto the customer. In 2008 K&S Industries bought the Nuriootpa Sawmill in South Australia, to secure a consistent supply of raw material for the pallet operation. The company has increased log intake to 25,000 tonnes per annum, expanded the range of products and now supplying 4 states. We invite you to browse our website for your New and Used Pallets, Export PalletsPine timber, Hardwood Pallets, Hardwood Timber, Skids, Produce Bins, Warehousing and Cold Storage requirements. Our contact page will direct you to Victor, or feel free to send us a message on the form provided. If you want quality products and great service with decades of experience call us now, we know how to deliver on time. 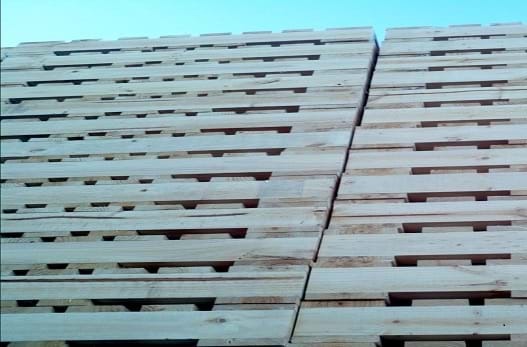 Pallets: Better known as K & S Pallets, we specialise in the manufacture of Timber Pallets, Export pallets, Hardwood Pallets, Plastic Pallets, Rental Pallets, Hardwood Stakes, Skids, Bearers, Strapping Grooved Bearers, Produce Bins, Plastic Bins, Cases and also provide pallet repairs and second hand pallets as well. We manufacture more than 1,500 pallets each day, so come to the experts for your pallets requirements. We source timber from our own sawmill which guarantees consistent supplies on time every time. Sawmills: Our sawmill operations date back to the 1930's and continues today as KSI Sawmills. We have invested heavily in our sawmill over the last few years so the quality, efficiency, and prices are world class. We are proud to source our sawmill timber supplies from strictly controlled Australian harvest plantations with Guaranteed supply contracts. Storage: K & S Industries offer extensive Cold Storage and Warehouse facilities, run with advanced temperature controlled technology and inventory management systems. Our warehouse solutions are ideal for small or large commercial bulk items and long-term storage requirements.